I have been trying to find someone that has answered this, with the setup i am running but havent been able to find it. in front i am running the datsport handling kit with the 280zx suspension set up. 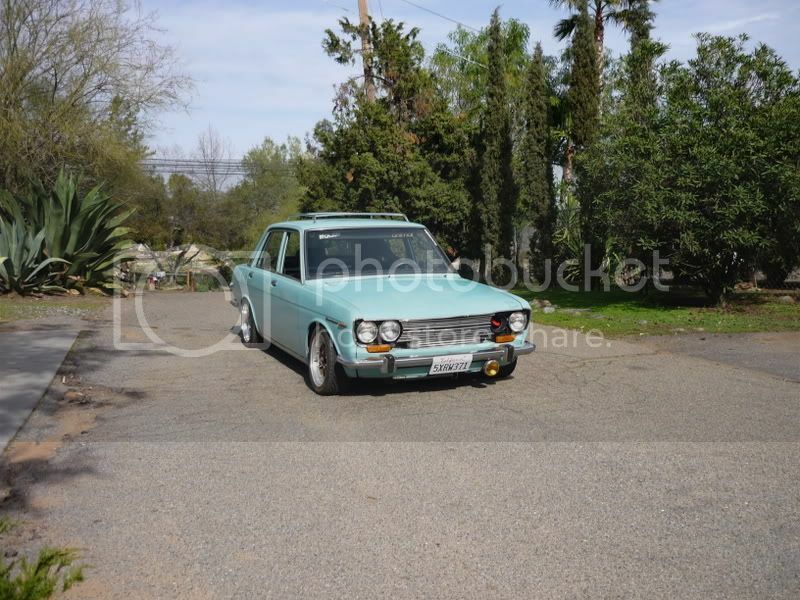 in rear i am running coilovers with stock 510 brakes. I just want a good fitment, flush to the car as possible with no problems. Am hoping to get rota rb's and i just dont want to buy a set and have them not fit. What do you have on there right now? Just find the offset of your wheel, add or subtract the number of millimeters to make a nice flush look and presto chango. Roll you fenders and call it good. Really not that tough. So to start what wheels do you have? ...this has been talked about a lot here, since the search is down I will clue you in on what I know. The Datsport kit works best with S12 (200sx) struts, but I will get back to this..... with the 280 struts you have, you will have a hard time getting a +33 or more wheel on there without the inner rim edge from hitting the strut tube, this depends on a few things...1. your coilover set-up (spring diameter ect..), 2. your strut length, 3. Wheel diameter 14/15/16/17+ inch wheels. 4. Wheel width. - now, there are many possibilities, but I don't think you are going to get there with your 280zx struts, I am not saying they won't work, but I got better results with the 200sx struts. - the reason the 200 sx struts are better for your application is because the strut tube is offset away from the spindle (place your hub mounts), what does this do?? it gives you more space to run a more positive offset wheel. (this space is between your inside wheel edge and the strut tube...this also increases as you move to bigger diameter wheels because the strut tube is angled in and the higher you go away from the spindle, the more room you gain. - the Datsport kit uses parts from a Aussie model 200B, late 70's early 80's model Datsun, it has a little wider front track (the distance between the spindle hub faces(left to right), or from the center of your front tires....whichever works.) So, since it has a wider front track then you need to compensate that with a more positive offset wheel. - Wheel spacers, these won't help you, it will negate the purpose of a positive offset wheel, so you are better off just trying to get the right wheel the first time without the use of a spacer. - there are pro's and con's for all the strut/wheel/tire combo's you could use, hard to cover them all because not that many people deviate from the standard 280zx stuff.....but you are in a bigger boat. like myself....if you read through my thread you might find a little more info that will help you make a choice, or maybe not?? - When you think about changing struts, you also have to think about brake calipers and spacing and all that.....it's a whole different subject......this is why we should really research every detail BEFORE we buy parts or at least ask these type questions.....don't feel bad, I am just as guilty!! you will see that when you read my project thread!! If you bought coils from troy, are you local? You can always have him modify your 280z stuff. I was just told he has done it before, as i was GOING to use the datsport kit til I found out of the work required to run 280z stuff. Its funny this just came up because I called a buddy of mine asking if i could use the Datsport kit with 280zx brakes. He told me some work had to be done to the struts, not the datsport kit in order for it to all work. I agree in that troy wouldn't touch the DS kit haha. I will bug him again and find out what has to be done to them. At the risk of sounding completely clueless, and even though I will never run the kit, can someone explain the problem. I am interested in learning about this. I don't get how the Kit as anything to do with the wheel fitting. Isn't wheel fitment a relationship between the hub offset and the wheel offset? 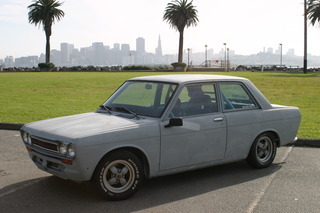 The datsport kit is based on the Australian datsun 200b front end. It uses a modified form of the 200b crossmember arms drag link pitman arm and idler arm. It is essentially an entirely different front end that improves the front suspension geometry thus improving the handling. The problem is the control arms are longer than the 510 ones pushing out the front track. No mater what strut/hub offset you have (510/280zx/s12 etc) you are still going to have a wider track with the datsport kit than you would with the standard 510 front end. You need to run a large positive offset wheel to keep the tires under the front fenders. Goichi1 has explained the strut clearance problem many times (very well I might add) with having large positive offset and small diameter wheel sizes (14" 15") and the datsport kit. ...Basically it comes down to planning, but I know too well that it's hard to plan anything if you are not sure what parts fit or work with other parts. Baz has explained this also a few times, in Australia they have different laws as to how low you can go and other inspections that are very strict. So this makes the kit "the one" to have in Aussie if you want an easy swap in your 510...or 1600 as they call it! these inspections make it work very well in Aussie, because with a 17" +30 or bigger wheel and the R30 strut (older skyline) you can get the front wheels to just barely, and I mean barely "not stick out" of the fenders or gaurds as they call them in Aussie terms. now when I say "not stick out" I don't mean they "tuck", I mean if you drop the front end you will be on the tire, unless you run some serious camber. But this is fine for our Aussie friends because of the above mentioned inspections (ground clearance) needed to make it pass. Now bring the kit to the states and let a Western Washington Redneck that migrated from Georgia (me) get a hold of it and then he starts to have issues....because said redneck (me) want's to drop his dime on a dime. Now he didn't know that he needed a special model strut, because he didn't ask.....Break out the grinders, drills, and welder.....we'll make it fit, because that's what we do....then we will decide what wheels will be needed to fit the aftermath...because all the other wheels just wouldn't clear the fenders! Now I will tell you, I think it's a really good kit, freakin' easy to install everything.....but I will also tell you that I hacked it up, for my purpose, I am no racer, but I think I have figured it out to the best of my ability. I re-drilled the LCA mounts, shortened the tierods, TC rods, and cut and re-welded the sway bar mounts, run 1 1/2 inch RCA blocks and my 16x7 +33 front wheels with 205's now tuck, and tuck nicely at zero camber.....but I have little over a degree.....and will adjust that soon....as I am playing with my suspension settings.....That is all, hope it helps. from what i can work out, 280ZX struts are too long & need to be shortened. and would need a 6 inch rim to work with our kit. I can say that 17x7x40, 16x6.5x38,16x7x35 15x6.5x30 15x6x25 will all fit ok.
on the S12 4 cyl strut. yes, I also shortened the struts about 2 inches, and used the MR2 inserts. So how much does it widen the track width? I thought ZX struts shorten the track width almost an inch. Im just hoping they WORK with the zx brakes and i can fit my suspension, a decent wheel, and have it low enough to enjoy where i want it. I’m running the Datsport kit with 280zx struts. I am running a 6" wide wheel in the front. I can get you the offset tomorrow. With a 6" wide rim I have barely enough clearance w/ the fender and w/ my camber plates maxed out positive. With this I still have quite a bit of negative camber. I have only driven my car for about 50 miles at the most so I can’t say anything about any unusual things happening.